Police in Texas are looking for help identifying three suspects wanted for aggravated robbery with a deadly weapon in a donut shop -- and there's a fairly good chance customers in the store at the time might remember them. That's because the robbers gave them donuts. Houston police released surviellance video of the Oct. 16 robbery at Shipley's on North Shepherd. It was in the middle of the day. One of the suspects, holding a handgun, immediately jumps on the counter and demands money from the registers. A second man also jumps the counter while a third takes the customers' cellphones. 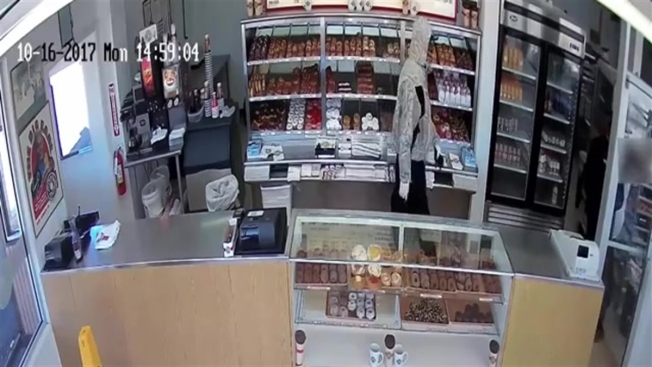 The third suspect, the one who took the cellphones, then jumps over the counter as well and starts offering customers donuts while the other two suspects rob the employees. He's seen on surveillance video handing out the treats as the other two suspects wrap it up and head out. All three then flee on foot. Anyone with information on the robbery is asked to call Houston police.